Carlos González Pintado was born in Madrid and currently lives in the town of Navalcarnero. In his student days, he earned a scholarship to study in the USA and graduated from Helix High School in the city of La Mesa, California, in 1964. In 1968 he began working for NASA, at the start of what was to be a career spanning more than 40 years. During this time, Carlos had the opportunity to personally take part in some of the most exciting episodes of the space race, such as man’s first steps on the moon. His brilliant performance within this organisation led Carlos to hold the position of Operations Chief in the Deep Space Communications Complex at NASA in Madrid, which he later combined with his duties as Assistant Director of the complex. 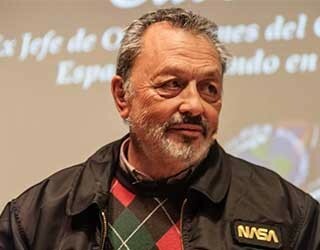 In 2011, NASA awarded Carlos González the medal for exceptional public service, one of the highest honours given by NASA to its non-American employees. Today he is retired, but Carlos continues to be active in the sector, giving conferences and writing essays about the space race.